Now, as you might guess from Ortho's logo, I'm a coffee addict. The Russians drink coffee only rarely; instead, they drink tea—by the glass, and they have special holders for hot tea glasses. My hosts asked me what kind of tea I drank, and I told them my wife's and my current favorite—?Russian" tea. They stared, then fell all over the room laughing. They explained to me that Russia doesn't grow any tea themselves—they import it. Makes sense—but somebody's doing a great job of re-labeling it and selling it to us innocent Americans. Fortunately, I like tea. I learned to when I was in London for a convention. I walked into a blue-collar café run by a couple of guys with Italian accents. They poured me a cuppa from a huge stainless-steel pot, black as Harry Dresden's duster. I took one sip and grabbed for the milk and sugar. That stuff was STRONG! Ever since then, I drink coffee by day and tea in the evenings, though my wife insists that it's not tea, it's substitute coffee. At any rate, I'd spent four days in Russia with no java! Or cappuccino or latte or mocha, for that matter. So I was delighted and relieved when a small group of fans invited me up for a cup of coffee. The aroma wafted delectably to me halfway down the hall. It wasn't quite ready when I arrived, so I got a good look at their coffeemaker—a tray with inch-high sides, to hold in the sand, heated by a built-in hot plate. Nestled in the sand were six demitasse cups of very finely-ground coffee with some hot water stirred in. It was novel, it was strong, and it was DELICIOUS! I think that brew was the really authentic Turkish coffee. I've always been grateful to those Russian fans. In the evening of the last day, a Russian radio announcer interviewed me. It was a nice long conversation, with a half-dozen or so fans gathering around. Finally the nice lady asked me, ?Stasheff - What kind of name is that? What nationality?? ?Oh, it's Russian,? I said. ?Russian?? She stared in surprise and disbelief—so did the fans. ?Yes," I said. "My grandfather changed it when he came to America. The original was 'Korostasheffsky.'? ?But that's Jewish!? she cried, somewhat scandalized. So did the fans. Then, catching her breath and changing the quality of her stare, ?Are you Jewish?? I tried to explain that my father and his family were Russian Jewish, but my mother and her family were mostly Irish Catholic. Then I told them the story of how my great-uncle Yasha was sent to Siberia for teaching peasants to read and write—that halfway through Russian grammar, the lookout called, ?The Cossacks are coming!? They didn't understand why this was a problem. After all, to them, the Cossacks aren't ferocious soldiers—they're those nice guys who live down the road a few miles. The interviewer finally gave up trying to understand and went on to the next question. Afterwards, I discussed with some of the fans whether my original family name meant ?People from Korostesh" (a big town in southern Russia) or ?Children of Stanley.? That one didn't surprise me—I'd known for some time that ?Stash? is Polish for ?Stanley.? They also asked me why we Americans liked Gorbachev so much, when he couldn't even speak proper Russian (to them, it was like a Californian hearing some people from Atlanta). I said, ?Because he stopped the Cold War.? The fans stared, startled. I think the commissars had been telling them that the Americans were out to conquer Russia or bomb it off the map. Turned out that, Russian or American, we all wanted the same thing—a secure and lasting peace. Volgacon had to be one of the highlights of my career, even though I found out that it was ending a day sooner than I had expected. I asked the interpreter to change my plane reservation, which she did, and off I went to Moscow. I found out later that the convention committee had a full day of sightseeing scheduled for the authors. I missed out on that. I also found out that instead of coming into Moscow, I could have selected Odessa as my port of entry—and exit. Since my father's family came from that city, and since I'd heard that it was the humor capital of Russia as well as being the Greenwich Village of Russia, I really wished I had known ahead of time so that I could have gone there. Then I found out that there was a cholera outbreak there. Guess not. Maybe another time. But Odessa being the humor capital struck a nerve, since in science fiction, I have the reputation of being a humorist (surprise to me—I thought I only put in some comic relief). Also, my father had an even better talent for humor than I do—in his eighties, he won a pun contest at ConFusion—so when I arrived back in the U.S., I called my father and asked if his dad had a good sense of humor. He said, ?Oh, yes, wonderful sense of humor!? So that's where I got it from. It runs in the family. I'm a little concerned about the next generation. Next week, I'll tell you the final part of the story—the trip home, which was just as exciting and bizzare as the rest of the journey. I arrived in Volgograd in the middle of the night but was welcomed warmly nonetheless. I slept longer than I should—jet lag and having caught a late flight—and rose to go in search of breakfast. The concierge, the nice lady who had taken my passport into her keeping, gave me directions, but since I spoke very little Russian, I had to ask a few kindly souls for directions. I finally found it, and was surprised to see that the authors and other foreign guests had a sort of mezzanine to ourselves, from which we could look down on the fans. I was surprised to see so many, especially since, as I soon learned, the Gang of Eight had made it illegal for anyone to run a business, and running a convention technically counted as a business (nobody said it had to show a profit). Rumor had it that they?d been building a gulag for just such offenders. Yeltsin faced the Gang down, declared them to be illegal, let Gorbachev out of house arrest and had the Gang arrested—some, rumor had it, in the act of boarding an outbound plane. Some of our conventioneers had just come down from facing tanks in Moscow, and were in a jubilant, even holiday, mood. 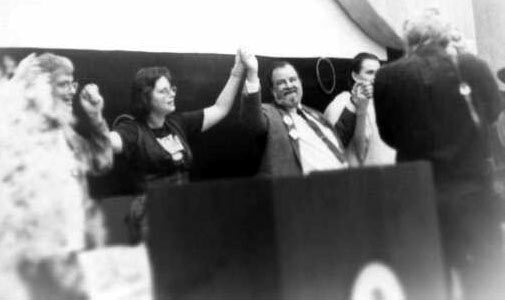 It was infectious; I couldn?t tell whether I was attending a science fiction convention or a victory celebration (probably both). At breakfast (tomatoes at every meal), I met some of my fellow foreigners: James Hogan; Professor Larry McCaffrey (no relation to Anne McCaffrey), deeply interested in cyberpunk; Terry Bison and his lady—he came fresh from having won both the Hugo and the Nebula—and a British fan named Chris Cheevers. They were all wonderful company, and I had to struggle to keep up with the conversation. I did manage to impress them all with my command of Russian—I was actually able to ask the waitress for tea with milk. More amazingly, she understood me. Then off to the panels, though Boris came close to taking a crowbar to the locked doors of the auditorium. Fortunately, a disgruntled custodian showed up in time to save him from breaking and entering. We had two translators, one from Petrograd (St. Petersburg) and one form Volgograd, but there enough fans wanting to talk that a gentleman fan had to step in and help out—he was fresh from spending a year at a small Michigan university, where he had felt very welcome, but had missed home. There was a panel on publishing, and the fans wanted to know why our books weren?t available in Russian, now that it was legal to read them. We tried to explain about royalties, but since that came down to our not publishing in Russia, it made little difference. Finally I said, "You want to read our books, and we want you to read them. There has to be a way to take care of the money problem, and our agents will find it." That seemed to satisfy them long enough for us to find publishers. Also to the fans' puzzlement was the concept of paying taxes, which would follow from receiving payment from Russian publishers. It seemed to be a completely foreign concept to them (you should pardon the pun), and I finally figured out why—for them, the Soviet government kept all the income from any factory or store, and doled it out to people as they needed it, sort of taxation in reverse. At least, I think that's why we had a cultural speed bump. A producer made an appointment with me to discuss making one of my books into a movie. I tried to get across he concept of dealing with an agent, but he became somewhat irritated. Afternoons were spent in activities—a visit to a Cossack village that had been kept intact as it was in 1900. I found out why Russians were reputed to sleep on stoves—the stoves are built as beds, heavily insulated to keep from burning your anatomy, and taking up half of a room. Then came a demonstration of Cossack riding, followed by a ceremony for becoming an honorary Cossack—you had to ride around the corral, then drink a very large shot-glass-full of Vodka balanced on the flat of a sword. McCaffrey was the only one with the nerve to try it—successfully, I might add. Then came lunch in a large Cossack-built hall. Every table boasted a bottle of mineral water and a bottle of vodka. We leaned that Gorbachev had outlawed storing drink, vodka included, but that the ancient treaty between the Czar and the Cossacks basically insulated them from any blue laws while they were on their home ground, so they could have and serve all the alcohol they, and their guests, wanted. The fans took full advantage of it. My afternoon appointment was postponed when one of the producer?s friends explained to me that the gentleman was "very relaxed." The next afternoon, we had a riverboat trip—on the Volga! I stood in the bows thinking, this is fantastic! I?ve heard of the Volga all my life, and I?m actually sailing on it!" We docked at a sandbar/island and had a round of party games, including improvising costumes from whatever materials were on hand, such as paper plates. The translator from St. Petersburg won, but she was attractive enough for me to suspect it wasn?t the costume alone that had done the trick. Fortunately, I hadn?t thought to bring a swim suit, so I simply took a nap on a boat seat. I did join in for the picnic, though. In the evening, I attended a literary party for Russian authors to meet foreign authors. I found out that every one of them had a stack of manuscripts in the bottom drawer (literally), which they were prudent enough not to submit to a publisher until they were sure the law had changed enough to allow their subject matter. I don?t know if they succeeded—I hope so. We also had a visit to the memorial to the soldiers who died at the Battle of Stalingrad (now Volgograd). Our hosts timed it so that we could see the changing of the guard (very impressive) and meet the sergeant in charge. We talked briefly about the future, and he took the hammer-and-sickle badge from his hat and gave it to me—he couldn't wear it anymore, the Soviet Union was been dissolved. I was very touched and honored. Hopefully I?ll be able to tell you more about this another time—and about the local broadcasters who interviewed me. Also, next time, I?ll tell you about my trip home—a minor epic in itself, and one that made me glad I?d learned high school French and a little—a very little—Russian. A wise man once said to me, ?There are two of whom we can never be jealous—our students and our sons.? Since I was both, I have remembered the saying well. I?m very proud of my children, especially since you?re reading this courtesy of one of them and with the support of the others. I can?t envy them or be jealous of their accomplishments, because they reflect so well on their mother and myself. I also have had occasion to be proud of some of my graduates—notably, in this case, Peter D?Alessio. I met him when I was teaching at a New Jersey college in his home town. He is always friendly, and filled with energy and infectious enthusiasm. He was an excellent student and helped me through many of the extra-curricular activates I tried to launch. He was a fabulous story-teller who could set an audience laughing in a matter of minutes, whether that audience was one person or a hundred—but if you sneaked in some serious ideas, he could turn into a thoughtful, earnest fellow seeker after the unknowable answers. He has always been a stalwart friend and sympathetic companion. I?ve been honored to know him. However, I can?t claim to have taught him anything about writing. I did coach him in how to produce and direct television programs. He turned into an excellent writer anyway, but declined to try for a career in professional TV and took a bread job instead. Why? Well, he had two very good reasons. First, because he wanted to spend his evenings playing guitar in clubs—and, second, playing what he wanted to play, not the umpteenth version of ?Proud Mary? just to please the crowds. So, of course, he accomplished both, gaining quite a following in the world of blues. He did not, however, get much writing done. What could I say? Tell him to stop being a true artist? Perish the thought! Then Bill Fawcett asked me to co-edit Dragon's Eye, a shared universe anthology about dragons, and I saw my chance. I recruited Pete to write a story about dragons for me, which he did quite ably—and the dragons turned out to be unique and memorable. It didn?t make it into the anthology, unfortunately; it was one of those wonderful stories that was too long for a short story, but too short for a novel. So Pete discovered more story to tell and started adding to it, shifting perspectives and making the improbable believable. The result is what you see?a novel entitled Uncle Merl?s Bar & Grill. You?re about to read it now; I hope you enjoy it as much as I did. Buy the Kindle version of Uncle Merl's Bar & Grill from Amazon for $2.99! Anyone Remember What Happened in Russia That Year? In 1991, I was invited to attend Volgacon, a Russian sci-fi/fantasy convention at Volgagrad (formerly Stalingrad) in the Soviet Union. I accepted with delight ? or tried to; my phone kept connecting to a high-pitched squeal; I didn?t know, back then, that a fax machine was trying to pick up. Finally I sent them a telegram and bought my ticket. A week before I was supposed to take off, my travel agent called to ask if I still wanted to go or if I wanted to cancel and get a partial refund. ?I?m still going," I said. "Of course." ?You haven?t been watching the news today, have you?? she asked. ?Why don?t you watch CNN for half an hour and call me back?? she suggested. I said I would, hung up, turned on the TV, and found that the Gang of Eight had just taken over the Soviet Union, and Gorbachev was under house arrest. Somehow, though, I had a hunch it wouldn?t last, so I confirmed my ticket, expecting the logical result ? that I would have to cancel at the last minute. I didn?t ? the Gang was out in a few days, and I took off as scheduled, heading for the U.S.S.R.. I arrived in the Republic of Russia. While I was in the air, the Soviet Union had been dissolved. I made a stopover in London, hoping to cancel my jet lag, and went to see a musical. Jet lag won, though, and I woke up too late to catch my plane. I went to the airport anyway, managed to catch another flight to the U.S.S.R. (er, Russia), and landed in the international airport. I managed to connect to the domestic airport to catch a flight to Volgagrad, thanks to an obliging taxi driver who asked me several penetrating questions and took the windshield wipers off his car, tucking them inside his jacket before he escorted me to the airline desk. That was my first inkling that Russia was in a recession. I got off the plane in the dark, about 1:00 am, saw the Volgacon banner but, of course, no one to meet me. I found a taxi driver who spoke English and referred me to another driver who was willing to accept my rubles, though I didn?t have the full amount. He took me straight to the hotel. I found out later, from my hosts, that I had been very lucky... but they wouldn?t go into details. I went up the steps to find the hotel door locked. I went around to the side, found another door, and knocked on it until someone came to see what the racket was. I said ?Volgacon? several times and the name of my host; she let me in, looking very leery, and called the organizer of the convention. He came down, looking braced for trouble (I found out later that the Gang of Eight had reinstated the law that made it a crime to run a business, which the con was technically doing). I pointed to myself. ?Christopher Stasheff.? He gave me a bear hug. Apparently, they didn't know I was coming; my telegram hadn't gotten through (well, it eventually did - I just got there first!). Boris woke up the translator and had her meet us in my room. That?s how I learned that most of the other guest authors had canceled, and I was one of only five who had persevered and come to attend. It was really unfortunate for them, but lucky for me ? made me look a lot more important than I was. Terry Bisson, for example, was fresh from winning both the Nebula and the Hugo, and a few other awards. He and his wife had taken the train down from Moscow, along with a translator; I, being a train buff, turned green with envy. I asked how the ride had been. They said, ?Cold and damp and absolutely wonderful.? Along with the Russian guest authors, the convention turned out to be a success, even though there were so few of us from the English-speaking world. So I arrived, too late for the welcoming committee, too late for the ride to the hotel, but miraculously in one piece. That was only the beginning of one of the most exciting weeks of my life... but I?ll tell you more about it in later posts. As most convention-goers know, the ?dead dog? party is a gathering of the con committee and volunteers after the convention is over. When I went to New Mexico, I met the dead dog, and am happy to report that he was alive and well, vigorous and very friendly, and his hindquarters were frequently out of line due to over-wagging. He is a black Labrador mix, and his name is ?Jack.? Some philistines might argue that, being dead, he couldn?t meet me until after I died (which I don?t plan to do in the near future, and certainly not in my past). It is therefore incumbent upon me to explain that, when barely out of puppyhood, Jack was orphaned ? I don?t know why, but I suspect a litter with two many puppies. He was turned over to the animal shelter, and put on the bottom of the list of candidates for euthanasia. By the time he came near the top, he had won the hearts of all the personnel so thoroughly that they couldn?t bear the thought of gassing him. This happened two or three times, with Jack making it to the top of the list and being, therefore, officially dead ? the fact that he was physically very much alive doesn?t matter to this account. Finally a volunteer remembered a professor at the nearby university who had recently lost a long-time canine companion and who might be ready for a new rescue. The professor was introduced to Jack and, of course, they hit it off instantly. Jack started attending the university -- at least, for walks near campus. He made friends of almost everyone who met him. One day I stopped by the professor?s office and discovered a scene I hope never to forget ? Jack, lying on his side with one child patting his head, another his side, a third his forelegs, and a fourth his tail. So the dead dog is alive, well, and guarding his owner diligently. Of course, there is the usual question of who owns whom, but in this case, most of us know the answer ? Jack, by this time, owns the whole university ? or at least, its hearts.